Studio/Run Time: ?Warner Bros., 104 mins. In episode 1F05 of The Simpsons (“Bart’s Inner Child”), a self-help conman runs a revivalist-esque meeting that leads people to reject restraint and do whatever they feel like.Yes Man follows a similar course, except here, the seminar preaches saying yes to life, which means literally saying yes to everything people ask of you, rather than being like Bart.also only follows one man’s story, the depressed Carl (Jim Carrey), instead of watching an instant-fix philosophy fall over its Ayn Randian contradictions through an entire community.It’s a logical next step from Carrey’s earlier feature Liar, Liar—first he couldn’t lie, then he couldn’t say no—that also capitalizes on the recent trend of feel-good-by-reclaiming-life films like The Bucket List and Last Holiday. 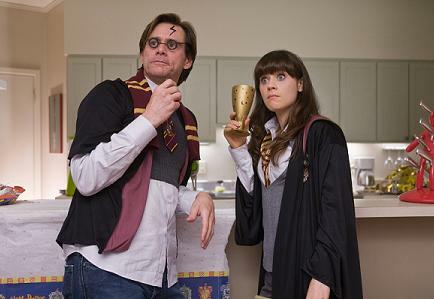 But Yes Man is a little smarter than those previous studio films, and though it’s a broad comedy, it’s not quite as calculated as its predecessors.One aspect either pumping life into (or removing life from) the film is its addition of Zooey Deschanel as Carrey’s Manic Pixie Dream Girl.As described by critic Nathan Rabin, Deschanel is Carrey’s love interest who exists “solely in the fevered imaginations of sensitive writer-directors to teach broodingly soulful young men to embrace life and its infinite mysteries and adventures. "Deschanel is about as perfect in this role as anyone could be, and if her tics are cutesy to the point of annoyance, that’s just the price that must be paid for this archetype.Unlike many previous attempts at this, she’s hard to hate, even when teaching a photography while jogging course. Carrey, on the other hand, is hard to love just because there’s nothing new to his performance.Of course, Jim Carrey acting wacky is the major box-office draw for the film, but that doesn’t make it any less disappointing that he’s just phoning in another of his stock wacky roles.That Deschanel and Rhys Darby (Murray from Flight of the Conchords) are so spot-on for their parts makes Carrey’s performance stick out even more than normal.They’re channeling a quirky indie comedy while he’s drawing from a 1996 slapstick studio film. Yes Man tries to pull from artsier fare in its search for a meaningful life but ends up a by-the-book romantic comedy with a gimmick.The saving grace that it’s actually watchable and funny at times doesn’t make its premise any less ridiculous or its execution less formulaic, it just means it’s not a complete waste of time.The Simpsonsepisode is still funnier, shorter and, strangely enough, deeper.